The new Super Limited Edition dedicated to the crew of the sailing yacht embodies the sporting spirit of the regatta, a glorious blend of courtesy, fair play, sportsmanship and courage. The generous 45 mm case is coated in black PVD to emphasise the enigmatic look. 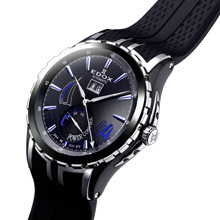 The elegant dial proudly sports a blue 44, the symbol of the class. Fitted with an Edox 94 mechanical calibre, the power reserve has a blue gauge on the dial and the timepiece is water resistant to 244 metres. 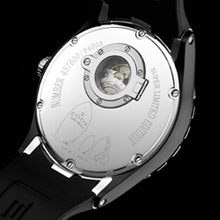 The engraving on the case back has been reinterpreted with a motif representing unfurled gennakers and the name of the watch. The famous porthole aperture affords an in-depth view on the watch's magnificent mechanism and provides the perfect finishing touch to the new Sea Dubai Super Limited Edition. The new Sea Dubai Super Limited Edition is limited to 244 pieces worldwide and is presented in a splendid wooden box with a porthole aperture.